Beautiful and intricate, Garry Shand's unique wooden sculptures bear all the hallmarks of a true craftsman at work. Every minute detail is created with pinpoint accuracy, in a delicate and precise process that belies the violence in which they were formed. For Garry is one of a unique band of carvers who are turning their back on traditional tools for something with a little more bite â€“ chainsaws. Visitors to the 19th annual Aberdeen Asset Management Scottish Traditional Boat Festival at Portsoy will be able to see his amazing creations over the weekend of June 23 and 24. The Carvery will be among dozens of exhibitors in the craft marquee at the Festival, which is expected to draw over 16,000 people to the North-east fishing village. Garry was a promising artist in his younger years, but never thought that he would be able to make a career - or money - out of the creative industries. He left school to get a 'real' job in forestry and rather than studying old masters, learned how to master a chainsaw at the Scottish School of Forestry in Inverness. 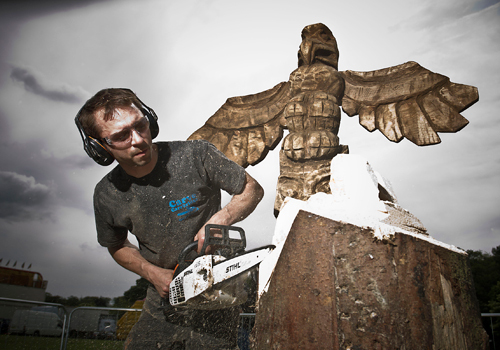 Garry (31) did not give in to his creative urges until he heard about chainsaw carving and its growing popularity across the United States and Canada. Then the floodgates opened. "My first carving was an owl. I took a pile of old firewood and had a go to see what I could do," he says. "I was quite pleased with it, so I put it at the end of the road up to the house. After a few weeks someone knocked at the door and asked me how much I wanted for it. It was only then that I realised that I was any good and people might actually be prepared to pay money for what I could do". Garry mainly works with a variety of different timber and although hard wood makes a better finish, soft wood is easier to carve. All of the wood he works with is sourced from sustainable, responsibly managed forests throughout the UK. 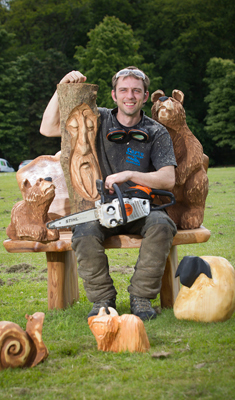 The Carvery was nothing more than a hobby for Garry until his first visit to the Aberdeen Asset Management Scottish Traditional Boat Festival two years ago when he realised that there was potential to make a living from chainsaw sculpting. He took a full stock of products with him to the craft marquee, but he virtually sold out on the first day and had to stay up until 3am the following morning creating more sculptures to sell that day. Roger Goodyear, chairman of the Aberdeen Asset Management Scottish Traditional Boat Festival, says that the event's craft marquee showcases the best of traditional skills and crafts that the area has to offer. The Festival is rooted in traditional crafts, but Garry has shown that you can take a very traditional craft like woodcarving and give it a very modern edge.